Key Difference: The term ‘bazaar’ can mean many different things depending on the country that it has been used it. When used in the Middle East or Asian countries, the word refers to an open market that sells a variety of different goods including foods, spices, household items, etc. In the western countries, such as the United States, the term is used to refer to a flea market that sells many different goods on sale. A flea market is a large open-air market where people come to buy and sell a variety of goods. These goods are more commonly used or second-hand, though some people may also bring new goods to sell. These markets may also have people that sell home-made crafts or merchandise. Flea markets and bazaars are more similar than different. Bazaars have a more authentic Middle Eastern look and feel to it, but the purpose of a bazaar and a flea market are same. 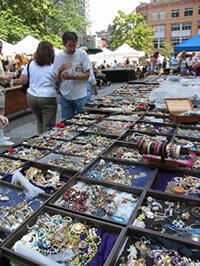 Flea markets are also open or closed markets that allow people to buy and sell goods and merchandise. The main difference would be that bazaars have more new goods that are available at a whole sale price, while flea markets have more second-hand goods for sale. These two also have other slight differences between the two. 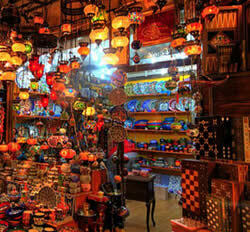 The term ‘bazaar’ can mean many different things depending on the country that it has been used it. The word’s meaning changes depending on the context that it is being used in. When used in the Middle East or Asian countries, the word refers to an open market that sells a variety of different goods including foods, spices, household items, etc. In the western countries, such as the United States, the term is used to refer to a flea market that sells many different goods on sale. In UK, the word takes another meaning, referring to shops that sell an assortment of donated or second hand items for charity. These are connected to churches or charities that help raise money for a greater cause. The most common usage of the word is used to refer to a market, an open or a closed area that holds many different street vendors that sell goods and products to the people. The people are expected to haggle and bargain for the merchandise, asking the vendor to reduce the price or club more items in the same price. These sale people bring goods from all over the places and can even sell exotic merchandise from foreign countries. The stall vendors usually have nearby places where the stalls can be locked up and covered for the night, some even rent out locations nearby to keep their cart and goods so that they would not have to waste time transporting it. The word ‘bazaar’ has been derived from a Pahlavi word, ‘baha-char’ meaning “place of prices.” The term became famous after it was adapted world-wide from the Persian using ‘bazaar’ to refer to open markets where buyers and sellers could meet and bargain prices for goods they require. Bazaar can be limited to selling only one kind of thing, or it can sell a variety of goods as well. Some bazaars have become famous for selected kinds of things such as the Zaveri Bazaar in Mumbai, India, which is well-known for selling gold, gems and other kinds of jewelry. Many places maintain bazaars, in addition to malls and supermarkets, as it is considered a part of the culture. Bazaars are also expected to have a cheaper price tag compared to the merchandise sold in malls. A flea market is a large open-air market where people come to buy and sell a variety of goods. These goods are more commonly used or second-hand, though some people may also bring new goods to sell. These markets may also have people that sell home-made crafts or merchandise. Flea markets are held on large fields, conference halls, school gymnasiums, etc., where people are invited to search for bargains and deals on items. The owner of the flea market is usually the owner of the land where the market is held, who then rents out stalls or stalls spaces to people that want to sell merchandise. These markets are not limited to having only used or second-hand goods. They can also have homegrown fruits, vegetables, crafts, clothing, accessories, perfumes, etc. These markets can be held annually, semi-annually, monthly, weekly or even on a daily basis. Flea market is often known with many other names, including ‘trash and treasure markets’ (Australia), ‘boot car sales’ (UK), ‘trunk car sales’ (US), tiangge (Philippines) and ‘Marché aux puces’ (France). The term ‘flea market’ is actually derived from the last name, ‘Marché aux puces’, which literally translated into “market where one acquires fleas”. The market acquired this particular name during the outdoor bazaars that were held in Paris, France during the 17th century, where people would sell their flea infested clothing or furniture to earn profits. Flea markets are similar to bazaars that are held in Asian and Middle Eastern countries. In some regions, it is even referred to as a bazaar. Flea markets also allow people to bargain and haggle for things that they want to purchase. People usually have to have a good eye during a flea market to sort the trash from the treasure. It is a good place to purchase home-made crafts, small jewelry, knockoff perfumes, knockoff branded clothing, purses, etc.